It’s been 14 years since the hijacked planes hit the twin towers in New York City. Among the many heroes who braved this terror and stepped forth to the rescue, some were four-legged. An estimated 300 rescue dogs scoured the rubble for signs of life in the aftermath of the tragedy. 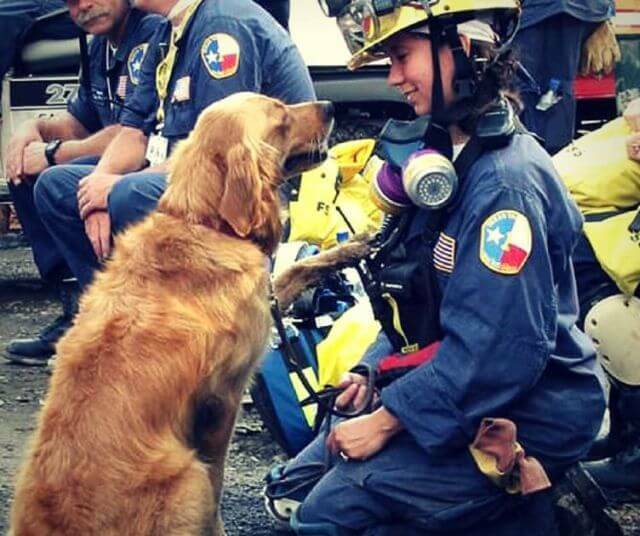 Earlier this week, Bretagne, the last surviving rescue dog to search Ground Zero in the wake of 9/11, returned to the site with her human Denise Corliss for the first time since the terror strike to celebrate her 16th birthday organized by various groups to honor the courage and compassion of the 9/11 Rescue Dogs at the face of tragedy. Bretagne takes a break from work at the 9/11 site with her handler Denise. 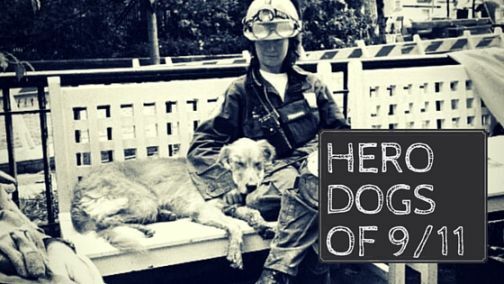 The dog worked for over 12 hours a day looking for human survivors. Corliss and Bretagne later served at Hurricane Katrina, Hurricane Rita, and Hurricane Ivan. Bretagne stopped searching six years ago and now visits an elementary school, where she helps first-graders and children with special needs learn how to read out loud. 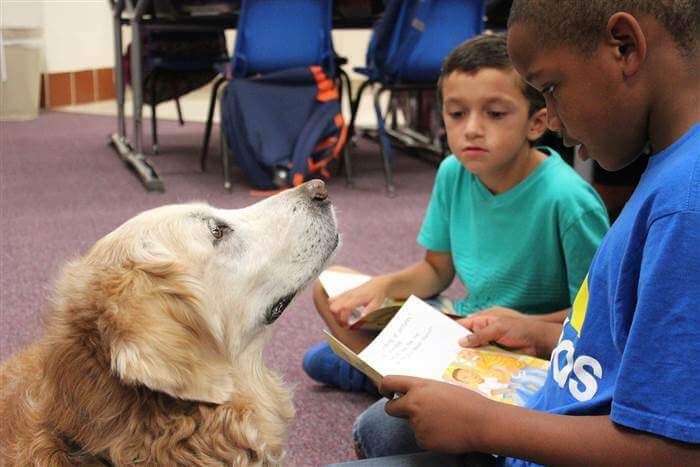 Now retired from active duty, Bretagne helps students practice reading out loud at an elementary school in Texas. Penn Vet Working Dog Center, a Philadelphia puppy ‘prep school’ has honored 9/11 search-and-rescue dogs by naming 97 of their trainee pups after them. One of their pups is named after Sirius, the dog who was killed in 9/11. 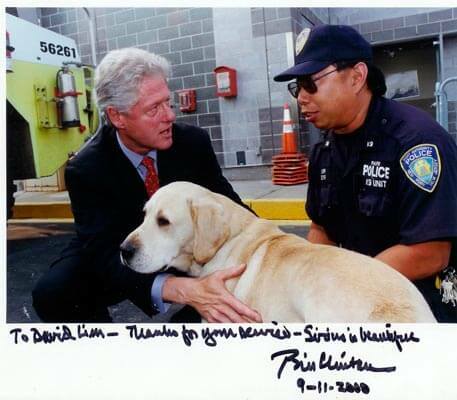 Sirius was an Explosive Detection Dog with the Port Authority of New York and New Jersey Police Department. And, he was the only police dog to die in the 9/11 attack as he was in his kennel at the bottom of the World Trade Center when it collapsed. Unfortunately, Sirius’ name is not engraved in the 9/11 Memorial as the foundation believes: “The memorial is only for the human victims.” But then, even without a placard with his name, Sirius shines on, like the star he was named after. Sirius may not find his name in the 9/11 Memorial, but he lives in the hearts of those who value his supreme sacrifice. The working dogs didn’t have the protective gear, but they worked tirelessly, to search for anyone trapped alive in the rubble. Corliss recalled that the rescue teams rarely got even four hours of sleep. The rescue dogs acted as therapy for the brave firemen and rescue workers of the emergency services, their little ray of hope amid death and debris. During the aftermath of 9/11, search and rescue dogs found so few living people that it caused them great stress because they believed they had failed. Handlers and rescue workers had to regularly hide in the rubble in order to give the rescue dogs a successful find and keep their spirits up. Roselle led her blind owner to safety amid havoc. One of the unsung heroes of 9/11 was a guide dog, Roselle, who led her blind owner, Michael Hingson, from the 78th story of the North Tower, a staggering 1,463 steps out of the building to the safety of a subway station. Omar E. Rivera with Salty, the dog who saved him. 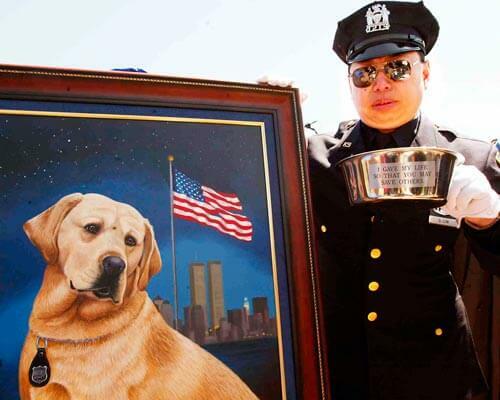 Salty, the guide dog for Omar E. Rivera, led Rivera and his co-workers to safety from the 71st floor of the Twin Towers. Rivera recalls how they tried escaping down the nearest flight of stairs, but it was filled with smoke and became very hot. It was so crowded and so terrifying that Rivera thought it was too much for Salty. He let go of Salty’s harness so the dog could head down unfettered and alone. The two guide dogs who led their visually-impaired owners down 70 floors in the World Trade Center before the towers collapsed on September 11. “I tried to let him go down first for a few minutes, but he said, ‘No'” Rivera said. “He refused to leave me. He came back to me. He said, ‘We are together. As long as we are in here, we are together. '” They made it down to the street level, safe. 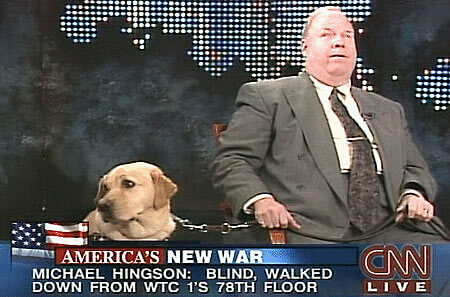 It’s only fitting that it dogs helped in the nabbing of the terrorists behind 9/11 attack. Here’s to the selfless service of all the rescue dogs, thank you! Posted on September 12, 2015 June 13, 2016 Author Abhishek JoshiCategories Hail the hound! Next Next post: Did You Kiss Your Dog Today?